Anime Studio is a comprehensive animation tool for professionals and digital artists to create 2D movies, cartoons and anime. Via its user-friendly interface and various handy tools, users can easily create their own characters and objects by drawing or scanning directly to this program. Users can thence add soundtracks or play around with some special effects such as line effects, lip-synching, glows, camera angle, particle effects and etc, to their animations. Once the artworks are completed, users can output their end-products to popular movie formats, including AVI, MOV, and Flash. The developer of this professional animation tool, e frontier, via its distributor, Smith Micro Software, has released the latest Anime Studio 6.0 couples of weeks ago. The original retail price for this software application is about $49.99 or users can download Anime Studio trial version for only 30 days free usage. However, Smith Micro has recently come out a promotion package. Users can purchase the software application online with 60% discount (or $19.99). 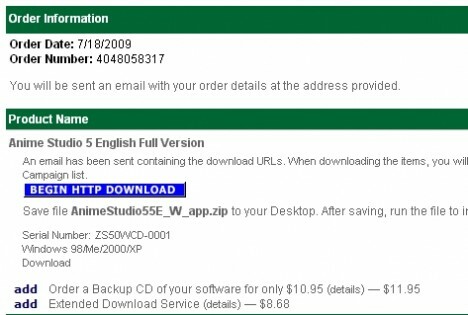 Besides this substantial discount rate, Smith Micro is also giving away free license to users for its older version, Anime Studio 5.0. Undoubtedly significant improvements and enhancements have been added to Anime Studio 6.0, but if users would like to grab an older version of this product completely free with a serial key, then they should not let go of this opportunity. Users who want to grab the free license for Anime Studio 5.0 can go to the promotional site via the link here. At the promotional page, users need to click Mac (for Mac OS) or Win (Windows OS) to continue. Click Continue Checkout at the shopping chart. 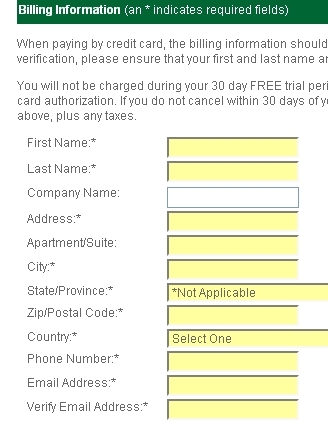 Users are required to fill in the billing information. Once it is completed, click “Submit” to proceed. Upon completion, users will be given a confirmation order indicates the product download link together with a valid product serial key for activation.